As the US has evolved along increasingly imperial lines, mercantilism has grown more obvious and intrusive. Over US$3 trillion is administered via government programs and bureaucrats. With so much money at stake, the political process itself has been increasingly rationalized. In many ways US Inc. is a large business, run by powerful people who have a great deal at stake financially. Less and less is left up to chance these days. Candidates are vetted for malleability and cooperation within the boundaries of what is tolerable. Someone like Congressman Ron Paul (R-Texas) offered up well-received ideas about freedom and free markets. The "establishment" ostracized him and the GOP itself worked hard to ensure he would not win the nomination nor even have a voice at the convention. Rules were changed to ensure that Ron Paul's delegates did not obtain clout and when this was not enough, delegates were intimidated physically and even beaten up. But someone like Democratic president Barack Obama ran into no such resistance. He was very obviously a "chosen" candidate – one selected by a US power elite for purposes that still do not seem entirely clear. But there are many tales surrounding his background, most of which have to do with CIA affiliations not only for him but also for his family. Access to his records going back all the way to kindergarten have been barred and there is considerable evidence he was born abroad. As president, Obama carried on with the various programs of what we might call the Imperium. He continued its wars, its domestic intimidation and its corporate empowerment. Part of Obama's program involved the continual degradation of the US economy. By raising taxes, increasing regulation and further militarizing the US economy, Obama guaranteed both the continued rise of mercantilism and the further impoverishment of US citizens. This is a considerable accomplishment within the context of the anger and frustration that many in the country feel. Of course, Obama has been helped by what seems to be a controlled mainstream media that faithfully reports his perspectives and refuses to probe his policies too aggressively. Obama himself has helped his cause with a professorial wonkishness that is somewhat disarming. He doesn't come across as an especially manipulative or destructive type, not overtly anyway. He is, in other words, a good front man for the interests that supported him and helped place him in the most powerful job in the world. His mission: To further mercantilism and increase US support for internationalism and global government. His performance within this context has been adequate and thus those who backed him before are apparently making every effort to ensure he gets another term to "finish" whatever it is he has been charged with accomplishing. Obama himself, as we can see from the first debate between him and challenger Mitt Romney, is probably somewhat psychologically at a disadvantage in this campaign. No matter who you are, it is difficult to defend behaviors that are intended to be destructive of the very citizenry you were elected to serve. Thus it is, perhaps, that Obama found it hard to defend his policies and term in office. Mitt Romney is said to have won the first debate. Of course, Romney has been picked by the same special interests that selected Obama, one surmises. Nonetheless, Obama is the Chosen One. Romney is merely the backup. And so a great many manipulations are now taking place to ensure that Obama is seen as having momentum despite his recent weak performance. It is instructive to look at what is going on because it gives us a clearer picture of the ease with which the power elite exercises its clout on behalf of those it wants to support. Whether you believe elites are merely a network of powerful people with similar interests or a cohesive cadre of globalists, the manipulations being applied to the Barack Obama campaign for a second term as US president are truly remarkable. Media is spinning like crazy on his debate performance. Polls now show him drawing ahead. Osama bin Laden books and movies are suddenly appearing. President Obama waved to the crowd after speaking at a campaign rally at George Mason University in Fairfax, Va. ... After a lackluster debate, President Obama faced the prospect of a second piece of bad political news with Friday morning's jobs report. Instead, Mr. Obama – and the economy – received some unexpected good news. Economists will spend the rest of the day parsing the numbers and arguing over exactly the best way to describe the report, but there is little question about its overall thrust: positive. An energized President Obama, appearing at a campaign rally outside Washington, seized on the news, saying "this country has come too far to turn back." Speaking to 1,935 supporters at George Mason University a few hours after the numbers were released, Mr. Obama said, "This morning, we found out that the unemployment rate has fallen to its lowest level since I took office. More Americans entered the work force; more people are getting jobs." The rate dropped sharply, to 7.8 percent from 8.1 percent, because the Labor Department's survey of households showed a large gain in the number of employed people in September. The survey of businesses showed a smaller gain, but it also showed that hiring gains in July and August were larger than expected. ABC's Stephanopoulos Leads Post-Debate Media Spin for Democrats ... Leading into tomorrow's presidential debate, journalists are busy setting expectations for the candidates. On Sunday's Good Morning America, ABC's George Stephanopoulos argued that Mitt Romney is under "huge, huge" pressure: "He is behind right now. He is behind nationally, he's behind in all of the battleground states. This is the last big audience that Mitt Romney is going to have with about four and a half weeks left to go." But more undecided voters will be swayed by the media's post-debate spin about who won and who lost than by any pre-debate expectations. Reviewing the last several campaigns, MRC analysts have found a clear trend of network reporters fawning over the performance of liberal candidates, while harping on any perceived weaknesses or gaffes from conservatives. One of the most reliable pro-Democratic pundits is none other than George Stephanpoulos – not especially surprising, given his track record as a loyal operative for Bill Clinton's 1992 presidential campaign, but hardly the objective, unbiased voice touted by ABC News. MRC has documented how, in eight out of the last nine general election presidential debates (every one since he joined ABC News in 1997), Stephanopoulos has gone on his network's airwaves to claim victory for the Democratic candidate, all in the guise of offering impartial analysis. Report: Obama campaign outpacing Romney's in ads ... A new report finds that President Barack Obama's re-election campaign has run more than twice as many TV ads in nine key states as has the campaign of his Republican challenger, Mitt Romney. The Nielsen Co. said Friday that Obama's campaign had run nearly 230,000 ads in Nevada, Colorado, Iowa, Wisconsin, Ohio, Florida, Virginia, Pennsylvania and New Hampshire from the beginning of the year through early September, compared with about 87,000 for Romney. All are considered battlegrounds this year, with both candidates competing heavily in those states for votes. The biggest disparity was in Ohio. Obama's campaign ran just over 51,000 ads in the state compared to nearly 17,500 for Romney. No Republican has ever won the White House without carrying Ohio, and recent polls show Obama ahead there. Wisconsin, the home state of running mate Rep. Paul Ryan, is the only state where Romney has edged the president in ads. Nielsen said Romney's campaign had run 1,952 ads there compared to 1,391 for Obama. Perhaps the most startling promotional mechanism has to do with the death of Osama bin Laden. In numerous articles we've explained that it is very difficult to believe that bin Laden died on May 1, 2011. Along with many others, we believe he more likely died ten years ago of Marfan syndrome leading to kidney failure. When proclaiming bin Laden's death the Obama administration produced no DNA, no photos, no body and no eyewitness to support the announcement. Additionally, accounts varied widely regarding bin Laden's death and even whether or not his body had actually been dumped at sea, as claimed. Search the Internet for "bin Laden" and "Daily Bell" for more on this topic. A film dramatizing the death of Osama bin Laden is set to debut next month on the National Geographic Channel, two days before the presidential election. "Seal Team Six: The Raid on Osama bin Laden," from The Weinstein Co. and Voltage Pictures, will air Sunday, Nov. 4, the channel said Thursday. 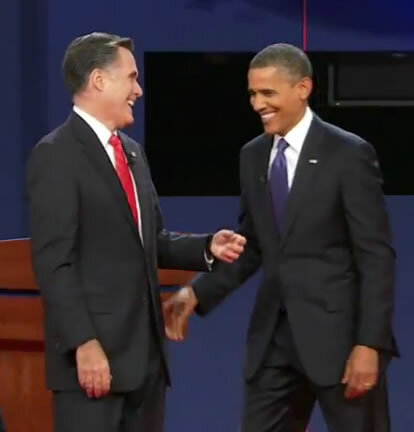 President Barack Obama faces Republican challenger Mitt Romney at the polls two days later. When we add all this up, a fairly definitive picture of massive manipulation emerges. The US economy is moribund and slipping into what seems to be an actual depression but according to brand new Fedgov statistics, employment is up sharply! Obama's debate performance was a losing one but the media itself is defending his conduct and providing a number of alternative narratives. There are polls being reported that show how the president's campaign has been able to muster considerable promotional clout in "battleground states." And most disturbing of all, a flood of media reports continue to celebrate the recent death of an archenemy of the US who apparently died ten years ago. There are many who dispute – who cannot psychologically tolerate – the idea that the US and the West are subject to massive elite manipulation on a number of fronts. We are told that to proffer the idea that Money Power has created a virtual false universe of sociopolitical and economic assumptions is simplistic and "paranoid." But please observe these elections and the vastness of resources being brought to bear on reelecting Barack Obama. More eloquently than anything we can write, this barely concealed display shows how deeply elite control actually runs. If all else fails, of course, the votes themselves may be miscounted. Conveniently, ballots are being sent to Spain. We've written about that here: VIDEO: Who's Counting the Votes? Anthony Wile is an author, columnist, media commentator and entrepreneur focused on developing projects that promote the general advancement of free-market thinking concepts. He is the chief editor of the popular free-market oriented news site, TheDailyBell.com. Mr. Wile is the Executive Director of The Foundation for the Advancement of Free-Market Thinking – a non-profit Liechtenstein-based foundation. His most popular book, High Alert, is now in its third edition and available in several languages. Other notable books written by Mr. Wile include The Liberation of Flockhead (2002) and The Value of Gold (2002).